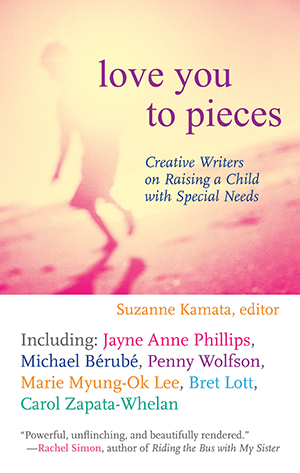 The first collection of literary writing on raising a child with special needs, Love You to Pieces features families coping with autism, deafness, muscular dystrophy, Down syndrome and more. Here, poets, memoirists, and fiction writers paint beautiful, wrenchingly honest portraits of caring for their children, laying bare the moments of rage, disappointment, and guilt that can color their relationships. Parent-child communication can be a challenge at the best of times, but in this collection we witness the struggles and triumphs of those who speak their own language-or don’t speak at all-and those who love them deeply. “Love You to Pieces is groundbreaking. Our public discourse about disability is dominated by the voices of medical professionals and fix your child tomes. These stories elevate the experience of people with disabilities to the level of literature. It is a must buy book for anyone who parents, educates, or supports young people with disabilities. "[A] moving collection of well-crafted memoirs, fiction, and poetry that reflects the wild emotional complexities of living with and loving a child with disabilities." " . . . a reminder of life's changeability; surprises occur and parents persevere, even in seemingly fixed situations." "...the work acts as an eloquent support group for these parents. Highly recommended."